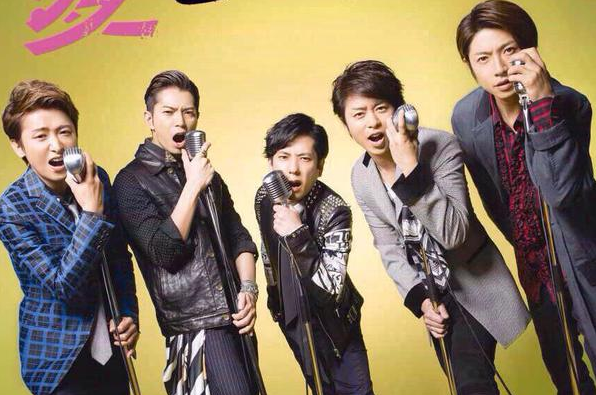 Okay, today is the release of Arashi’s third single for the year, Ai o Sakebe (shout your love). It’s the theme song for wedding company Zexy and it’s back-to-back with Yumenikakeru, which is the theme song for JAL’s Fly to 2020 campaign. Not a few have pointed out that AOS’ introduction reminds them of That Thing You Do with the guitar riffs (and it looks so cool with their dance moves, but it would have been cooler if they were holding a real guitar). And then, there’s the PV, which to some, is very Maroon 5’s Sugar. And yes it is, but hey, this is the theme song for a wedding company. How many concepts can you work with for a wedding PV? The wedding is the concept itself, plus the surprise factor works like a charm. In Maroon 5’s MV, the band went to several weddings, while in Arashi, they only went to one wedding. It seems only the groom and four groomsmen knew that Arashi was going to appear, so it was a surprise for the bride and the guests. As soon as teasers for the PV came out last month, fans were tweeting that they would like Arashi to surprise them on their wedding day too. There were several suggestions on how to make this happen–get a groom who’s powerful enough to make them appear, like Johnny-san, perhaps? (Someone suggested one of their managers, but then, do their managers have the influence to make them appear at private events? LOL) Or marry one of Arashi…in your dreams. I love how they combined the actual cut, rehearsals BTS and wedding event in one PV. If one didn’t know any better, it does give the vibe of a happy song, and it is. But there is also an element of bittersweetness to it because it is a song for a girl that these guys have liked since they were 17 (well, Nino is #forever17) and now, she was getting married…to someone else. There’s no rancor when they wish her happiness though and acknowledge that even until now, she’s still out of their reach. And oh, the nostalgia pinches the heart. The chorus is easily an earworm. I wonder what an Arashi wedding will be like…speaking of which, we all know the cyclical rumors about J and then recently, speculations on Sho. One thing I’ve learned in fangirling idols, we can speculate all we want but fans know nothing and only time will be able to prove anything. Yep, speculate. That’s all we can do when it came to idols, especially Johnny’s. Oh, we can add “waiting” to that list actually. reading all those rumors about Sho can really get depressing. hehe. but yeah we shouldn’t get too carried away because nothing has been proven yet, all are just speculations.